Sicemdawgs.com listed four non-conference games added to the schedule. Originally, we had heard that the first two games of the CBE Tourney in Athens might be against Niagara and William & Mary. However, we're now hearing that George Washington will be one of the CBE Teams destined for Athens (ht - MemphisDog). 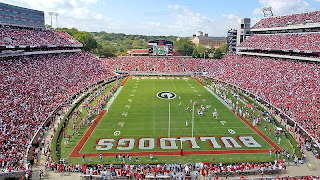 Interestingly, there's an outside chance for a terrific Georgia sports weekend Nov. 11th. We open the weekend and the season with a home basketball game against Wofford. Then we get Auburn at home on Saturday. Potentially, we'd get another basketball game on Sunday at home in the CBE Tourney. It's a long shot, but possible. For a start like that, we'll need Kentavious Caldwell. Any word on any renovations to the Steg? Is it the new scoreboard thing for real? They are doing some interior renovations this offseason. The roof is getting some work and I think they are doing something with the scoreboard, but I can't remember what. By roof, I mean Ceiling obviously. Glad to see we will get the nerds when the students are on campus. Let's make it 3 in a row over those losers.